Making my bowl of cereal was different as well. Whereas I typically procure the ingredients of my breakfast unconsciously, today I noticed every little step in the assembly line: the fetching of the cereal and subsequent pouring, the opening of the fridge to find the strawberries, the plucking of the knife from the silverware drawer, the strawberry cutting, the placing of the strawberries in my cereal, the returning to the fridge for milk, the pouring, and finally, the planting of the spoon in my bowl. I was struck by the absence of something as well – a low-grade anxiety that often accompanies my cereal making. 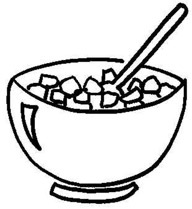 Before I’ve even begun making it, I always picture the bowl of cereal sitting on my counter, ready for me to eat. By keeping the finished product in mind, I end up feeling pressure to get to the conclusion as soon as possible, and become frustrated by all the mundane details that go into it. By the time I begin eating the cereal, I’m usually reading an article of some kind or talking to my wife; sometimes I’m even on the phone with my business partner, addressing some new idea or mini-crisis that’s popped up on the East Coast before I woke up. So I never do get to think much about my cereal, let alone enjoy it. When I think about it, most of my work day is spent in this busied state of imagined accomplishments followed by the practical steps I need to take to achieve said accomplishments. I’m rarely ever conscious of the little things. That’s what made today so different. By being aware of all the “invisible” details of my morning rituals, I awakened the little joys in them. Pressing my toes into the bedroom carpet felt safe and good. Knowing how to pour the correct amount of cereal based on the weight of the box and the angle I poured it at triggered a small feeling of accomplishment. And eating was fantastic; from the first bite, my body felt infused with warmth and calmness and my head tingled from the fruit’s sugar. As it turned out, life was much better on consciousness. That’s why I decided to start this blog. Recently, I’ve discovered some things that have improved my life and business dramatically – things that I had no idea were important, or even existed, for the vast majority of my 32 years on earth. You could call these things life hacks, but they are really more perspective shifts. One of them is realizing that you feel a lot better when you give to others. Whereas my norm used to be storing up my resources out of fear that I might not have enough later on, today I not only enjoy giving to others, I need to do it. And when I do, I find I get a lot in return. In this space, I will give to you. I will share insights that others have passed on to me. I will share mistakes that have made me a better person. I will share things that I am still working out myself, which I’d love to get your opinion on. Above all, I hope that whatever I share will create some positivity for you. Congratulations on your new blog. Really enjoyed it. I have been doing the same since I retired last year as a way of giving back to my family, friends, colleagues, and the society that supported me through my career. Being in the moment is wonderful. Even in this big city, we can stop at stop lights and be aware, put the phones away, and look up at the buildings noticing things we never noticed before. It’s wonderful to enjoy the day and observations that I would have missed if I was not mindful. So happy to read anything that you write! Peace, Evan. Evan, thank you for sharing.